This beautiful bride was part of our feature on Pretty Pear Bride. A big shout out and thank you to them for publishing this new and different shoot! “We are living in a time that requires inventiveness and imagination. Ultra Violet symbolizes experimentation and non-conformity, spurring individuals to imagine their unique mark on the world, and push boundaries through creative outlets.”-Laurie Pressman, Vice President of the Pantone Color Institute. Our style team did just that when they dreamed up this unique Ultra Violet shoot. The inspiration was spurred on by the brides beautiful hair color created by Andrea Mezin of Styles by Andrea. Isn’t that color just AMAZING!! We were lucky enough to work with Shawna from Bleudog Fotography in this collaboration. She has the perfect eye, and captured the essence of the bohemian vibes we were trying to achieve. She photographed the Ultra Violet color in every detail, from the flowers down to the wedding ring itself. A bride with a floral anklet. One of the unique floral features of the styled shoot was the floral anklet the bride wore. It was the perfect touch to add to the Boho Bride feel we wanted. Wedding rings that are not diamonds. Many brides are choosing non traditional stones for their wedding rings. Lots of brides today are choosing alternative stones instead of the traditional diamond for their wedding rings. We chose to use a princess cut, amethyst, ring to correspond with the ultra violet theme. The Cloisonné box added the extra colors and Bohemian artistry we desired. Macrame is making a big comeback in the wedding industry. The Macrame backdrop, complete with driftwood detailing, from our Birdie in a Barn collection, hung from the magnificent oak trees at Chateau Adare, combining the old with the new. We made this creation ourself, it’s just one of the personal touches we like to offer our brides. A wedding cake can add a unique flare to your reception. 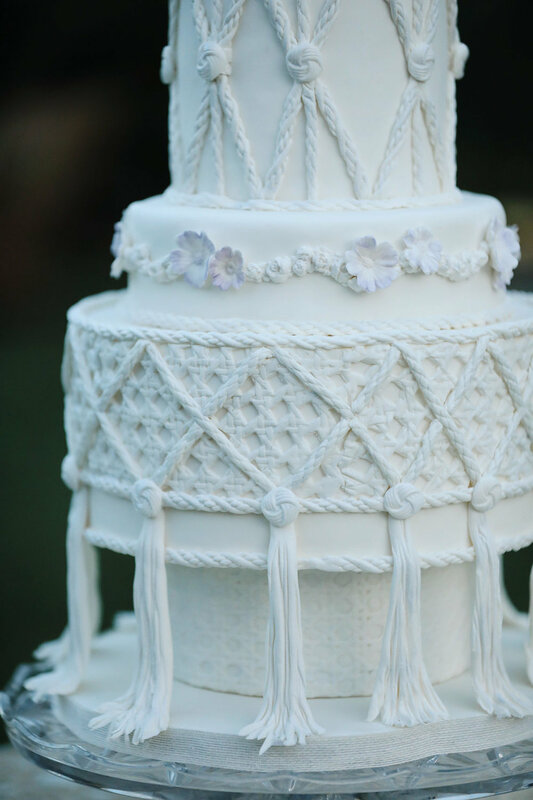 Susan Carberry, who is the owner of The Cake Cottage in Murrieta, California, and is a past winner of Cake Wars, created a stunning cake with an overall macrame design. It went perfectly with the macrame backdrop in our collection. The gum paste flowers were so realistic on the cake that it was hard to tell they were not. With all the color of the floral, the cake added the perfect element with its monochromatic style. The wedding cake looked stunning on one of our crystal pedestal cake platters. The vintage handmade table cloth added just the right amount of texture on top of our antique wrought iron table with its detailed scrolled legs. This wedding table included many unique features. We used our industrial farm tables for the bride, groom, and their guests to feast. We framed the table with our off white tufted chairs we call The Gabor Sisters. On the other side of the table we situated our boho upholstered iron benches. We also accented the chairs with pillows of corresponding fabric to tie the whole thing together. Pillows are a great way to add that pop of color or continuity you might need. Reception seating areas are all the rage. Seating areas provide a comfortable place for conversation and resting. Included in the styled shoot was a cozy seating area. It featured our rattan couch and chair we call, Lola and Noah. We accented it with a cute green velvet bergere chair called Penelope. The center of attention was an original mid-century modern coffee table called Brutus. Brutus has a grapevine base with a kidney shaped glass top. Somehow it all seemed to just be perfect together. It was so eclectic but very inviting. We were lucky to have the talented Alexa Nelson design the floral wedding invitations that went so perfectly with the ultra violet theme. As you can probably tell, this styled shoot was so fun to design and stage that we could go on and on. We hope you enjoy it as much as we did. A special thank you to our models, Mandy and Chris for playing along with us.